Don’t forget your Editorial Calendar below! If you are not using an Editorial Calendar (or Content Calendar), then you are doing your business a disservice. 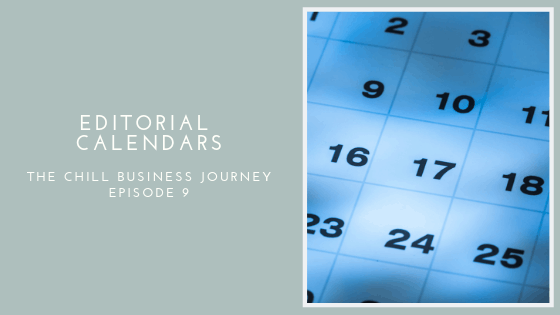 In this week’s episode, I talk about the origins of Editorial Calendars as well as how you can be using one in your business. As a small business owner, you have to wear so many hats to have things run smoothly. And if you suffer from shiny object syndrome several hundred times a day (like ME! ), then you are doing all you can to keep your sanity. Plates drop, cracks swallow things, but the earth keeps turning on its axis. That’s why an Editorial Calendar can be such a handy tool to keep your marketing messaging on track. You want to make sure you are creating original content on your website, and using your social media accounts to send traffic to your site. I mention an article I wrote a few years ago about this very topic, but it’s still quite relevant today. It’s called Connecting Social Media to your Website. And you guessed it….an Editorial Calendar will help you organize all the messaging you send out to social to let your followers know you just created the most fantabulous content! For the 3rd party tools, I mentioned a few and promised to share the links here in the show notes. Once you download your FREE 2019 Editorial Calendar below, block off some time to sit down and work on populating the next 3 months with content for the platforms you use. Be sure you are including posts that have calls to actions and driving them to your website. Feel free to shoot us a message on our contact page if you need help with our calendar.